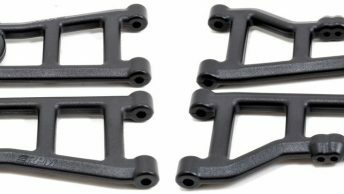 Just about two weeks ago, RPM released their front A-arms for the electric versions of the Traxxas Rustler and the Traxxas Stampede with a promise to have rear A-arms ready shortly. Well the wait is over! RPM’s rear A-arms are complete and ready to ship! Not only are the RPM A-arms stronger and more durable than stock versions, but RPM has also managed to eliminate over 7 grams of weight per arm! Thatâ€™s 14 grams of unsprung weight eliminated with a single pair of rear A-arms! Coupled with a set of RPM front A-arms, the total weight loss exceeds 24 grams or almost a full ounce! 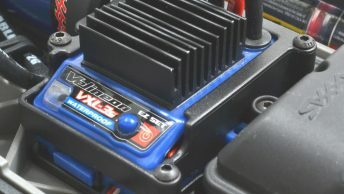 RPM has accomplished this without creating any weak points nor are the RPM Traxxas Rustler and Traxxas Stampede A-arms any more flexible than the stock versions. 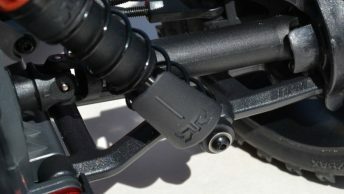 Additionally, RPM has adjusted the shock mount locations slightly to allow more noticeable tuning adjustments when using the inner or outer shock mount holes (while the center hole remains in its stock location). While RPM was at it, they’ve eliminated over 0.030″ or 1/32″ of slop from the inner arm mount and more than 0.010″ or slightly less than 1/64″ of slop at the outer hinge pin for an ultra-smooth, slop-free suspension system. 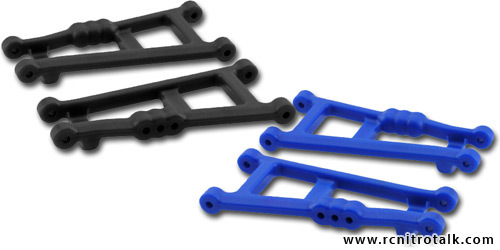 RPM A-arms for the electric versions of the Traxxas Rustler and Traxxas Stampede are molded in either blue or black and are sold in pairs 1 left rear and 1 right rear per package.